We are dedicatedly engaged in providing a superior range of Zero Air - Nitrogen Combination Gas Generator. The offered generator is widely used with analytical instruments. Making use of supreme grade components as well pioneered techniques, the provided generator is manufactured under the strict vigilance of experienced professionals at our sound manufacturing house. Owing to its salient features such as durability, easy operation, less maintenance and sturdiness, the offered generator is highly admired by our esteemed clients. 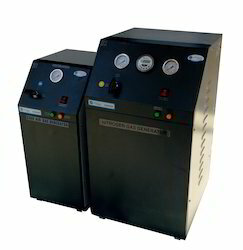 Zero Air Generator produces a continuous flow of high purity Zero Air at the selected pressure. The modular pressure swing adsorption (PSA) unit operates with alternating pressure increase and decrease. Untreated air flows under pressure through the reaction towers containing molecular sieve adsorber. Moisture, CO, CO2, THC and other unwanted components in the air are adsorbed, leaving Zero Air Gas of required purity. During the desorption cycle, the trapped substances adsorbed are released again at low pressure and the adsorber is ready for next cycle. The residual impurity content of Zero Air Gas can be reduced to practically any value required for the user's application. 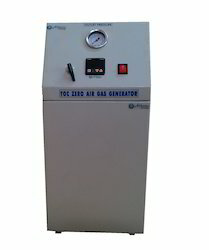 The Zero Air Generators are suitable for use in laboratories and industrial environments. 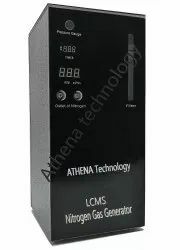 Gas for flame ionization detector(FID), flame photometry detector(FPD), nitrogen phosphorous detector (NPD). 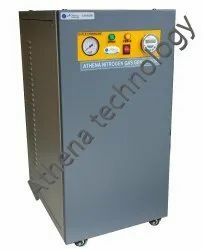 Purity "Three-level Purification N2: 99.99% CO2:0.039% Oil: 0.54ppm"
Athena Technology Nitrogen generators adopt Pressure Swing Adsorption (PSA) technology to generate ultra-pure nitrogen gas. Compressed air is dried and filtered through condenser tubes and filters. Lots of O2, CO2, moisture, hydrocarbon will be removed after gas passes through CMS cylinder in purification model. Then clean, dry and ultra-pure nitrogen will be generated. Nitrogen generators supply ideal ultra-pure nitrogen for GC(Gas Chromatography), LC/MS(Liquid Chromatograph/Mass Spectroscopy) and Thermal Analyzer. Continuously generate ultra-pure nitrogen through Pressure Swing Adsorption (PSA) technology. No longer need to use inconvenient and dangerous high-pressure nitrogen cylinders in the laboratory. Compact structure. Take up very little laboratory space. The carrier gas for various brands of GC and detectors. Gas for Gel Permeation Chromatograph. During the desorption cycle, the trapped substances adsorbed are released again at low pressure and the adsorber is ready for next cycle. Flow range available from 10 LPM to 30 LPM and above. 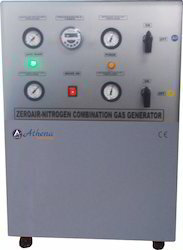 Nitrogen Gas Generator produces a continuous flow of high purity Nitrogen at the selected pressure. The modular pressure swing adsorption (PSA) unit operates with alternating pressure increase and decrease. Untreated air flows under pressure through the reaction towers containing carbon molecular sieves adsorber. Moisture, CO, CO2, THC, O2 and other unwanted components in the air are adsorbed, leaving Nitrogen Gas of required purity. During the desorption cycle, the trapped substances adsorbed are released again at low pressure and the adsorber is ready for next cycle. 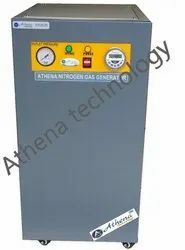 Nitrogen Gas Generator produces a continuous flow of high purity Nitrogen at the selected pressure. The modular pressure swing adsorption (PSA) unit operates with alternating pressure increase and decrease. Untreated air flows under pressure through the reaction towers containing carbon molecular sieves adsorber. Moisture, CO, CO2, THC, O2 and other unwanted components in the air are adsorbed, leaving Nitrogen Gas of required purity. During the desorption cycle, the trapped substances adsorbed are released again at low pressure and the adsorber is ready for next cycle. Flow range available from 10 LPM to 30 LPM and above. 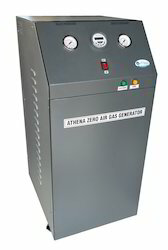 We Athena (An ISO 9001:2008) N2 generator uses world advanced PSA technology, separate N2 from the air. Whole equipment is controlled by programs. N2 output flow and pressure are both quite stable. It is a physical method to produce N2, compared with chemical technology, our equipment has advantages of no pollution, no corrosion. It could longer GC lifetime. It is very safe to use, long lifetime, stable quality, and very easy to use. It could completely meet the requirement for kinds of GC. This equipment uses PSA technology to produce nitrogen. Carbon molecular sieve has the different absorbing ability with nitrogen and oxygen. Under some pressure, the carbon molecular sieve could absorb oxygen, thus left nitrogen could be collected. After purification, pure nitrogen is produced. When released pressure, carbon molecular sieve could release collected oxygen into the air. In next step, it could adsorb oxygen to produce nitrogen again. The whole process is cycled. 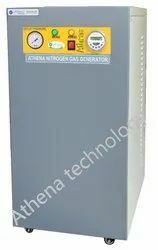 Nitrogen generators supply ideal ultra-pure nitrogen for GC (Gas Chromatography), LC/MS(Liquid Chromatograph/Mass Spectroscopy) and Thermal Analyzer. Take up very little laboratory space. Improve analysis accuracy, lower cleaning requirement on the detector. Match with GC and analytical column. Gas Purity: the amount of hydrocarbon is less than 0.5ppm (such as methane). Regular output flow and pressure. It's durable in use and produces high-purity air. Atomizing gas and vent gas for Liquid Chromatography and Mass Spectrometer. 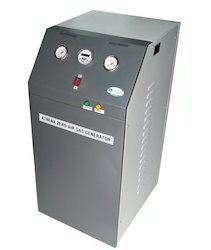 Nitrogen generator uses electro-catalysis method to separate air gas. Stable and pure air enters electrolysis cell, and oxygen in the air is separated, then left nitrogen gas is outputted. Two-level catalysis: Oxygen content in nitrogen is less than 3ppm. 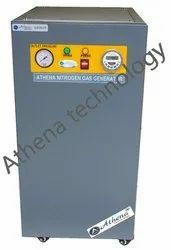 Looking for Nitrogen Gas Generator ?